As you all know, I'm a huge fan of the Real Simple Wedding Magazine. I reviewed the Real Simple Wedding Magazine 2009 and the Real Simple Weddings Magazine 2010 edition. 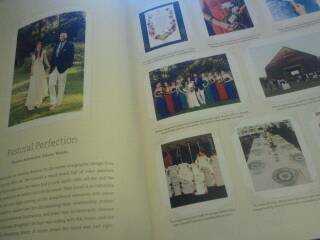 And now as almost a newlywed of one year, I get the pleasure of reviewing the 2011 edition of the Real Simple Wedding Magazine. The one thing that as a bride and now wife, I can truly appreciate about the Real Simple magazines is their simplification of processes. As any bride knows, the storm that arises the minute you say "yes" can be overwhelming. One of the first things brides do is start scouring the internet and looking at bride magazines. 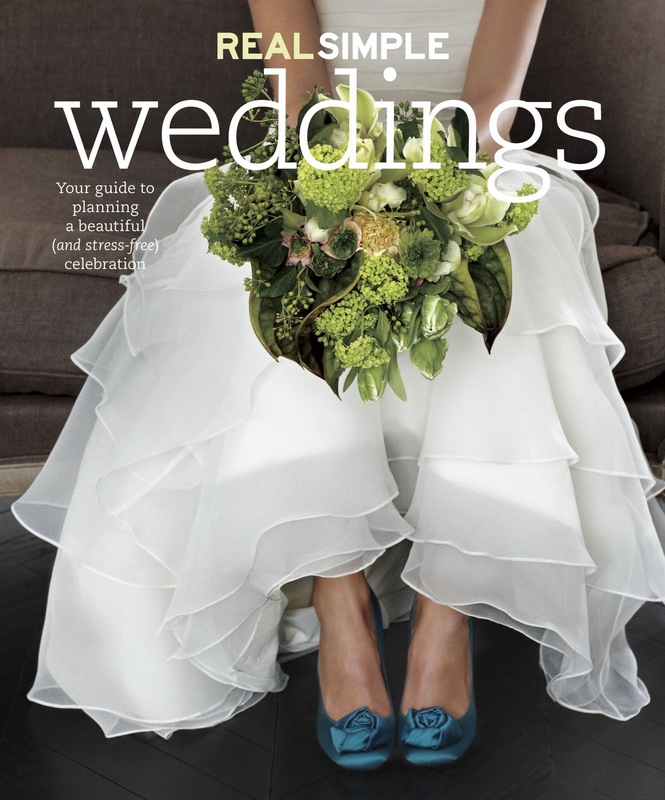 Seeing as I still get many of those popular bride magazines I can honestly tell you that one thing that separates the Real Simple Wedding Magazine from the rest is the pure and simple fact that every chapter is helpful. Especially for the newly engaged. It is pretty much the best gift to get any new bride. The contents cover everything from budget, location, dresses, flowers, decor, food and more. 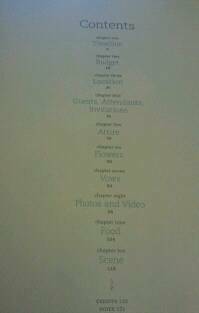 Many chapters cover images and examples and the best part, between each chapter there are REAL weddings with REAL brides and REAL details. 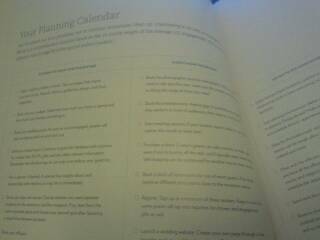 and the best part, a Planning calendar that really breaks it down. My biggest complaint with other magazines is that the substance is repetitive, minimal and completely lost in the sea of advertisements... Real Simple Weddings Magazine has hit the nail with really helping brides simplify things and how to get started (especially if you are newly engaged). The focus is on substance. The focus is on Real. The focus is on simplifying things... In essence, its the magazine every bride wants. I love this mag, and it was the first one I picked up as a bride. It's real, easy to read, and not at all overwhelming. I don't think I've ever seen this mag. Hmmm will have to look out for it. Couldn't agree more. It might be expensive compared to other wedding magazines, but it's really the only one you need to get. I completely agree! Of the probably over $100 I spent on bridal magazines, this was hands down the best one. Now I give it as a gift, with a bottle of champagne to my newly engaged friends! Bought this magazine the second I saw it and I have to agree, it's a godsend in a beautiful and simple package for the newly engaged. I feel like I know what to do now, and the photos within are so inspiring. I also ended up with a free year's subscription to Real Simple for buying this wedding edition. However, i'm dying to know about the dress on the cover and can't find ANY information on it! It's pretty much exactly what i had in mind, which was what inspired me to buy the magazine in the first place. Anyone know how I can get more info? Not sure if she's correct, but it looks close. I plan to get a copy of that wedding magazine, thank you for sharing it. Yeah, I don't think I ever came across this magazine either. I just hope they have this in the local bookstore (it doesn't have much of a selection) so I could try it. My biggest complaint with other magazines is that the substance is repetitive, minimal and completely lost in the sea of advertisements. My concept about weddings it that it's a celebration of love and that the couple shouldn't put themselves as prey to the pre-wedding stress and fight. Just look forward to the luxury safari holidays or any honeymoon plans that you have if you're really on the verge of letting out steam. I love your themes. It even inspired one of my finest work: vintage wedding dresses bristol so many thanks and more power. I was never one for overly fancy weddings myself. In fact, just about the only thing otherworldly stylish about our wedding was my wife in the dress she picked out from the wedding dress shops in somerset. I love this magazine. I'm really hoping our wedding photographer perth would be able to capture the moments that we'll have in our very simple yet most important day of our life as a couple. I must agree with you guys. This magazine site promotes good side of couples, love and wedding. How I wish to have one of this dramatic concept for my own wedding and have this wedding at wedding venues oxgordshir. I've been looking forward to my simple wedding at the long island country club. The more intimate, the better. Simplicity for me is the best when it comes to a wedding day, it adds solemnity to that occasion. And when it comes to reception, long island party venues is the best. I rest my case. Even for something as special as a wedding, you can still keep things simple and be memorable enough for your london wedding photographer's camera at the same time. It all boils down to how you carry yourself in the outfit. I'm also a fan of the magazine. You don't really have to pay for a wedding planner if you really read the kind of stuff that they write. What I do like for them to add in their articles are custom jewelry lists to choose from. If there is one thing I can wish for my wedding day, that will be a bridal jewellery melbourne-made engagement ring and a sunset proposal. So dreamy! 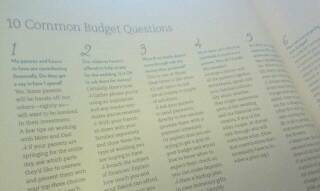 I am also a big fan of real simple weddings magazine cause it helped me a lot on my job. I'd like to add that in my decade of experience as a wedding planner, ny jewelers is one of the best if not the best when it comes to wedding accessories. All the collection is gorgeous.Liked the floral pants cool! Even the nail paint is also fine. Wow, that's a beautiful wedding dress. A lady would look gorgeous on it. Incredibly a great page in here indeed. That wedding dress is adorable. I'm sure your lady looks gorgeous on that. Incredibly amazing. I definitely savored all bits and pieces of it including all the comments and I have added you to my bookmark list to check out new articles you post. Take your chances and move forward to achieving your goals. When you trust yourself, there's no way you could fail. You just have to focus and move forward.